A Magnitude 1 spring produces over 64.6 million gallons of water per day. Florida has thirty-three (33) Magnitude 1 springs, more than any other place on earth. 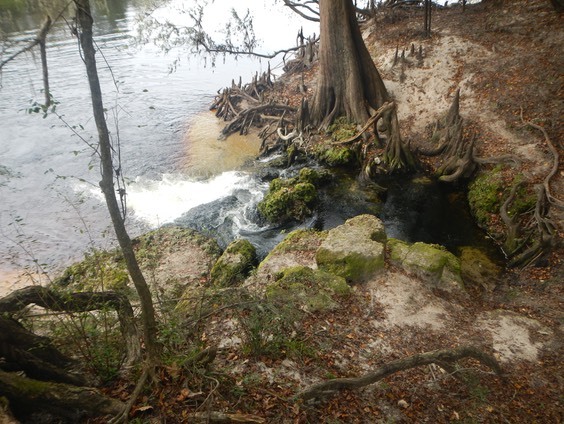 Over 700 springs have been documented in Florida with more discovered each year. Most of Florida's springs arise from the Floridan Aquifer. Florida has over 700 natural springs and counting. More are discovered each year. These springs arise from the Floridan Aquifer, a deep porous limestone sponge that traps water under all of Florida. One hundred ninety-eight (198) of these springs are found in the middle section of the Suwannee River basin, the area we paddled on this trip (Madison Blue Springs State Park on the Withlacoochee River to Branford on the Suwannee River). Several Magnitude 1 springs are found in this area. A Magnitude 1 spring produces over 64.6 million gallons of water per day. Florida has thirty-three (33) Magnitude 1 springs, more than any other place on earth. The following video shows some of the springs I passed on our 65 mile trip down the Withlacoochee and Suwannee Rivers.